My nephew called yesterday afternoon to ask if I'd do a story for the magazine that comes out in a few weeks. I've worked at the paper for over 10 years but he's now the head nacho. I told him I was interested in doing the story and asked him for the scoop. He said it's a story about Gas Station Food. Not just any gas station food but Bayou Fresh Seafood. It's a small restaurant that happens to be co-located with a gas station. I was intrigued so I told him I'd love to do the story. My appointment was this afternoon. The place not only serves fresh seafood prepared like you want it, but they also serve sushi. I would not have guessed that 3 p.m. would have been a busy time at a seafood restaurant but the place was buzzing. I talked to the owner and his waitress. They were delightful. A couple customers heard me interviewing and said, "I came here last week for the first time and it was incredible. I brought my friend back today." I won't reveal the story here until after publication, but I had a fun afternoon. I plan to go back with Jilda and eat. After I got home, I took the dogs for a walk. I noticed more violets blooming so I snapped another pic. The dogwoods should be out in force tomorrow. That would be my kind of gig, reviewing a resturant, especially if the food was free. It sounds as if the restaurant is thriving - and deservedly so. Love your violets. That would be a fun thing to do, can't wait to read your article. Gas stations/truck stops often do have the best food. A find like that one does deserve to be shared. Hope the two of you do go back! That will be good advertisement for the restaurant and they will get buzzier. I'm looking forward to reading the rest of the story. I happen to love seafood very much. Can't wait to read the article. 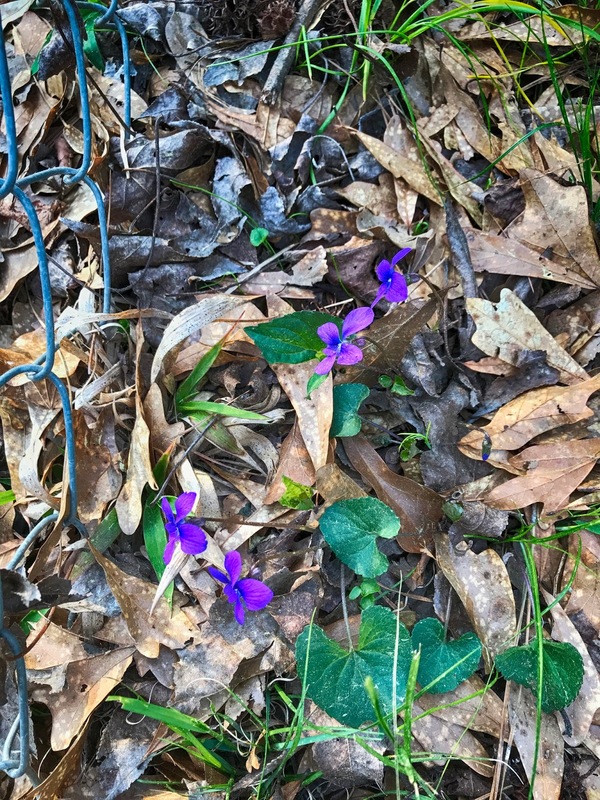 For me violets mean that spring has come. Of course we have none yet.